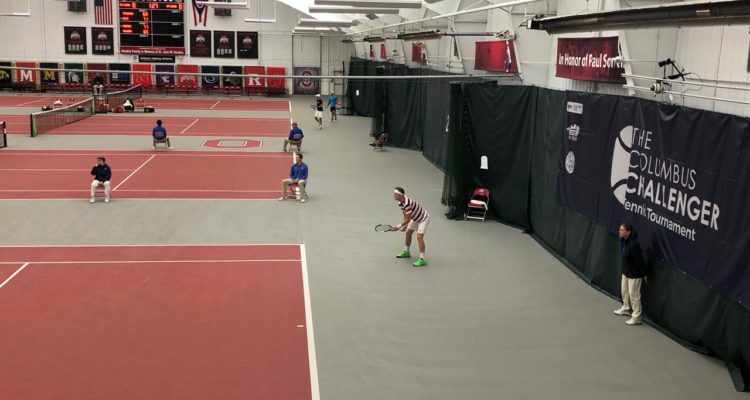 The pair will battle for the Columbus Challenger title on Sunday at noon at the OSU Varsity Tennis Center. Two wild card entries will meet in the singles final of the January Columbus Challenger. 2016 champion and Ohio State junior Mikael Torpegaard will face Jeffrey John Wolf for the title of the ATP Challenger 80 event. Torpegaard edged out No. 12 seed Bernabé Zapata Miralles of Spain 6-3, 7-5. The 24-year-old from Denmark saved three of the four break points he faced, capitalizing on three of his own chances to seal victory in one hour and 32 minutes. Wolf continued his great run of form with a 6-1, 6-3 win over Dutchman Scott Griekspoor. The World No. 366 from the United States fired 14 aces, winning 89 per cent of his first service points to advance to his first title match on the ATP Challenger Tour after only 58 minutes. Torpegaard won both of the two previous meetings with Wolf in Winnipeg and Columbus last year. This entry was posted in ATP Challenger Columbus, ATP Challenger Tour and tagged ATP Challenger Tour, Columbus Challenger, Mikael Torpegaard.